Hi all, I was hoping somebody may be able to help me out and just leave the Bride and Groom the only ones in colour (the rest in B/W).This is totally out of my range of skills.Thanks in advance. An easy one really and easier on the full size one. Add a Hue and saturation layer and desaturate fully. 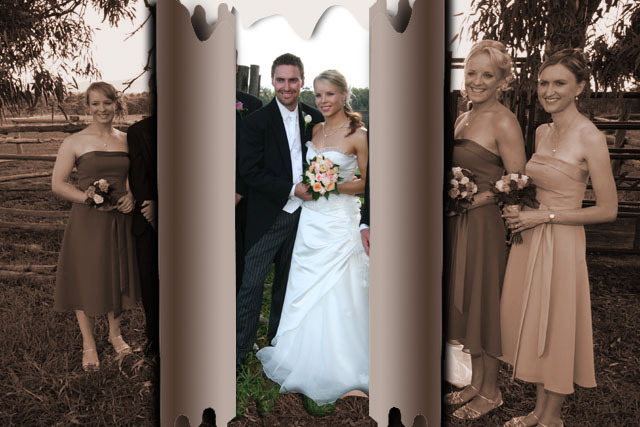 Now paint with black on the mask of the hue and Saturation layer to omit the adjustment from the bride and Groom. Another way is duplicate the layer and convert that to black and white either destaurate or use your preferred method to obtain grayscale. Now either mask or delete the bride and groom to reveal the colored version below. These are just 2 of the ways to do it. Using PS7, I copied the picture, and used the channel mixer as an adjustment layer, choosing desaturate to render the pic into greyscale. Then I painted the bride &amp; groom with black on the layer mask that goes with any adjustment layer to block the effect of the greyscale conversion. Finally, flattened the image and saved! See, I just subconsciously figured that the tallest guy next to the bride was the groom! I just saw the the pic as a technical problem and never really looked at it! Good thing creeduk is more observant! "It may be that your only purpose in life is to serve as a warning to others." WOW! These are both great, despite Grant getting the Best man.Thank you both. my 2nd version,(Er.... well it is their day why to spoil with three best men,Sorry,they are out,Ladies look lovely so I kept them,Hope you may like it) After all these I feel Why you want to spoil the original image,they are better than these wracks.. Thanks mcliu, I especially like your first one.The other one is nice but unfortunately some of the party is blanked out. Great job though. Here's a compromise. 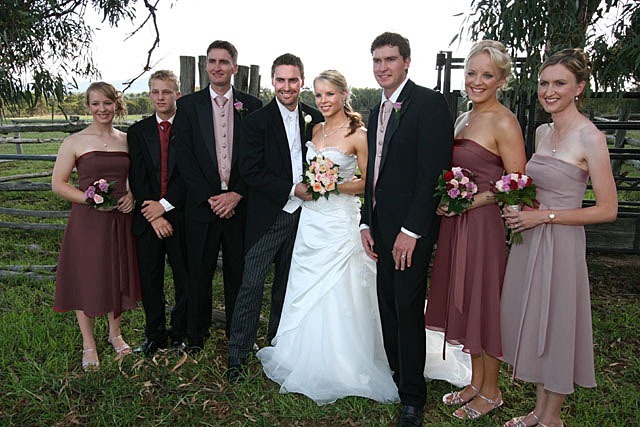 It consists mostly of reducing the saturation in the bridesmaids' dresses and the groomsmens' waistcoasts, so that they don't overwhelm the bride &amp; groom with so much colour. The a bit of brightness &amp; contrast was added to the Bride's &amp; Grooms' heads, to make them a bit more noticeable. And last, there's a bit of all-round sharpening. 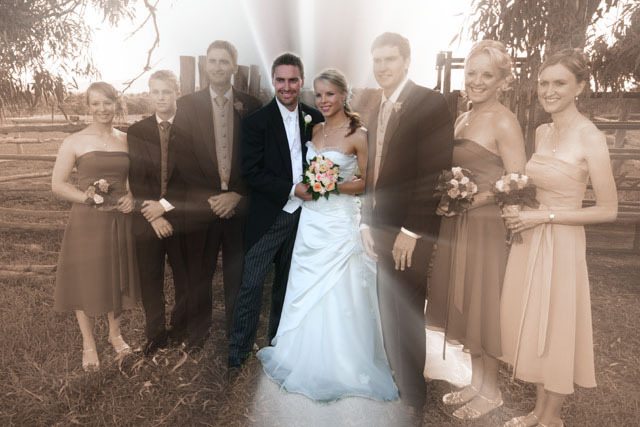 I had a go for the lolz, but I couldn't make the bride/groom stand out equally (the bride seems to stand out more).